Mood board: Comme des Garçons collections invite the kind of intellectual speculation often only levied at Japanese and Belgian designers: just what did that shoulder line mean? What view on contemporary life is being foretold with those boots? There are rarely any concrete answers of course, but Comme’s poetic samurai tailoring for A/W 2016 – presented to the throb of techno house – seemed decidedly less existential than previous seasons. Scene setting: The show was set in a back room at The Crédit Lyonnais headquarters and split into chapters. 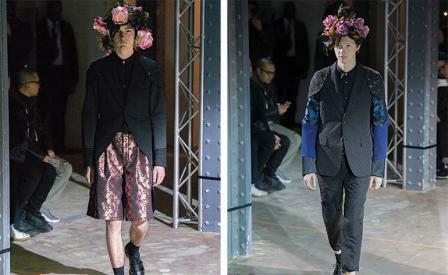 Models came out as a group of three or totally alone in a lingering tempo, feeding a quite mood of dandyish fragility. Best in show: For next season, two-buttoned tailored jackets came with articulated, patch-worked sleeves. Shoulder pads were flipped inside out; elbow patches were spliced and sandwiched in between layers of floral jacquard, printed silk and wool.